Faculty may request that books, music CDs, DVDs or VHS be placed on reserve. Please use the online request form above for all Reserve item requests (including media). Faculty may also send a list of titles to Connie Karlen, ckarlen@macalester.edu. 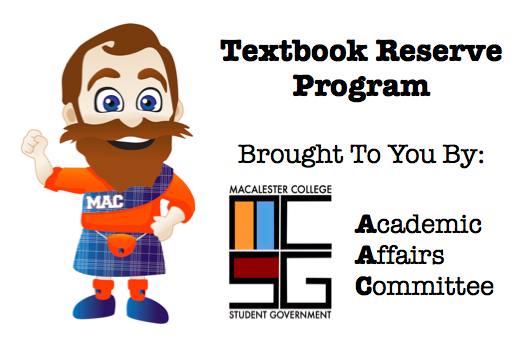 In collaboration with Macalester College Student Government (MCSG) the library maintains a textbook reserve program which offers limited copies of select textbooks for short term checkout. All textbooks are chosen and purchased by MCSG’s Academic Affairs committee with additional titles purchased twice per year. This highly popular program is just one of the ways students and the library are working to off-set the high cost of textbooks. See search box above to check what books are on reserve for your courses. For more information, visit the MCSG Academic Affairs Committee’s Textbook Reserve Program page. Under certain conditions specified in the law, libraries are authorized to furnish a photocopy or other reproduction. One of these specified conditions is that the photocopy or reproduction is not to be “used for any purpose other than private study, scholarship, or research.” If electronic transmission of reserve material is used for purposes other than those specified, or is in excess of what constitutes “fair use”, that user may be liable for copyright infringement. This institution maintains the right to refuse to accept material for course reserves if, in our judgement, placing the material on reserve would violate copyright law.